Baby’s skin looks seemingly the same as adult’s but functionally, they are different until their first year. These differences are important especially if you are caring for baby with eczema. By having a basic understanding of baby’s skin functions, you can better decide the best care you can offer to your baby and how best to manage the eczema more effectively. In article, Why does My Baby and Child Develop Eczema?, we talked about skin barrier’s role in development of eczema. The skin barrier refers to the Stratum Corneum layer of the skin, that is, the outermost layer of epidermis. It decides the health and integrity of the skin and how well your baby’s skin is protected from the external environment. Prevent transepidermal water loss (TEWL) out of the skin. Prevent loss of natural moisturizing factors (NMFs), which act as efficient humectants that impact water-handling properties of the skin. Prevent entrance of environmental chemicals, microbes and irritants into the skin. How Different is your Baby’s Skin compared to Yours? Epidermis (outer layer of skin) of baby is thinner than adult’s. Baby’s skin contains lesser total lipids than adult’s. 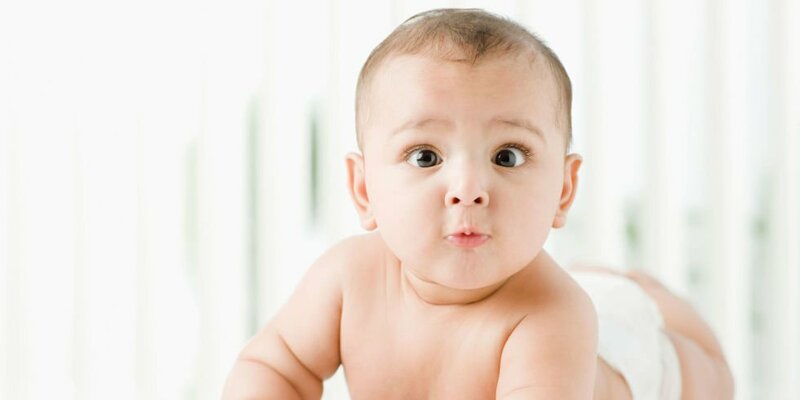 Baby’s skin contains lower amount of natural moisturizing factors (NMFs). While baby’s skin barrier appears intact since birth, its functions (the way it stores and transports water) are immature and continue to develop during first year of life. In other word, it becomes adult-like only after the first year. Our skin allows water to be lost through it as part of sweating. Thinner and immature epidermis in baby skin that is not fully developed will allow higher-than-normal water loss, which often leads to skin dehydration and penetration of more chemicals. Even though baby’s skin renews faster than typical adult (that is, faster healing), defective Filaggrin protein expression of the skin makes it unable to proliferate, thus weakening its structure. Think of eczema skin as the wall without strong mortar holding the bricks. Eczema skin is prone to penetration of various substances and chemicals means higher risks of excessive absorption of harmful chemicals, infection of harmful microbes and skin injuries and inflammation. 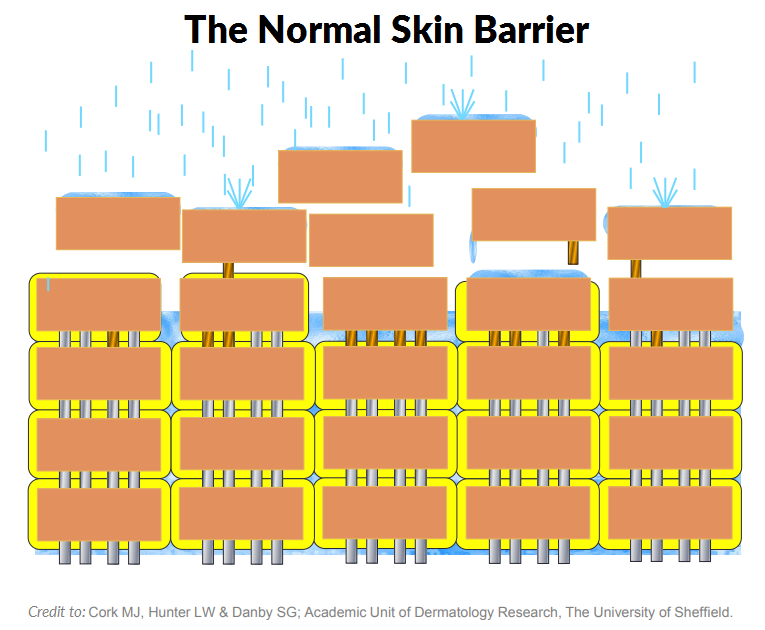 Impaired skin barrier explains why eczema cases are higher among babies than adults; and why they usually heal after childhood. We now learn that water is integral to our skin. Water loss is unavoidable. Thinner epidermis of baby skin and impaired skin barrier of baby’s eczema skin means higher rate transepidermal water loss (TEWL). Markedly dry skin is a main feature of eczema and increased TEWL happens even before the obvious onset of eczema. • With lower lipids content of baby skin, we must not over-cleanse our baby skin and further remove the natural sebum. Good bathing regimen that involves use of very mild natural cleanser, brief duration of bathing of 10 minutes or less and moisturization after bath is highly recommended. Constant moisturizing will help protect the baby’s skin. • Dehydration is bad for skin but drinking excess water will not do much for eczema skin. • Baby’s skin is thinner and organ systems not fully developed, baby is more vulnerable to toxicity of products. So much chemicals can penetrate through the baby’s skin, more so for eczema skin that is permeable. We should be very careful about what goes onto our baby’s skin and be sure to read the product labels to identify harsh ingredients such as parabens, SLS, propylene glycol, formaldehyde, etc. (This will be covered in detailed in chapters to follow). In the articles – Skin Expert’s Guide: How to Choose the Right Moisturizer for Eczema Skin and Making the Right Choice: Understanding and Using Products for Eczema Skin, we share about how to choose the right moisturizer for baby or child with eczema and the key criteria that should form your basis for decision-making. Cork, M.J., Danby, S., Vasilopoulos, Y., Moustafa, M., MacGowan, A., Varghese, J., et al. (2008). Gene-environment interactions in atopic dermatitis. Drug Discovery Today: Disease Mechanisms, 5(1), e11-e31. Cork, M.J., Danby, S.G., Vasilopoulos, Y., Hadgraft, J., Lane, M.E., Moustafa, M., et al. (2009). 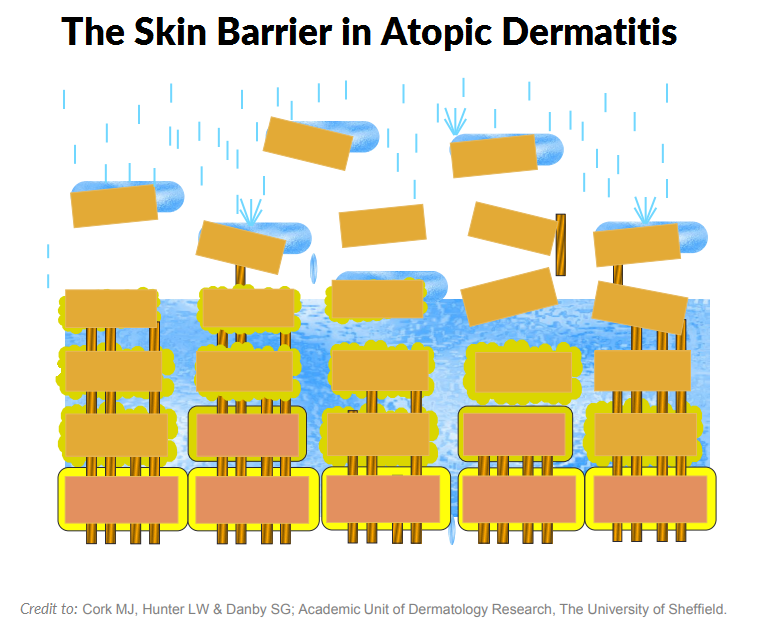 Epidermal barrier dysfunction in atopic dermatitis. J Invest Dermatol, 129(8), 1892-908. Cork, M.J., Robinson, D.A., Vasilopoulos, Y., Ferguson, A., Moustafa, M., MacGowan, A., et al. (2006). New perspectives on epidermal barrier dysfunction in atopic dermatitis: gene-environment interactions. J Allergy Clin Immunol, 118(1), 3-21; quiz 2-3. Janeta Nikolovski et al. Barrier Function and Water-Holding and Transport Properties of Infant Stratum Corneum Are Different from Adult and Continue to Develop through the First Year of Life. Journal of Investigative Dermatology. Volume 128, Issue 7, July 2008, Pages 1728-1736. This entry was posted in Baby Eczema, Eczema & Dermatitis, Eczema Causes and tagged baby skin and eczema, baby skin is not the same as adult, care for baby eczema skin, caring for delicate baby skin, normal skin barrier, skin barrier in eczema.